Manufactured in Allemagne from 1928 until 0. 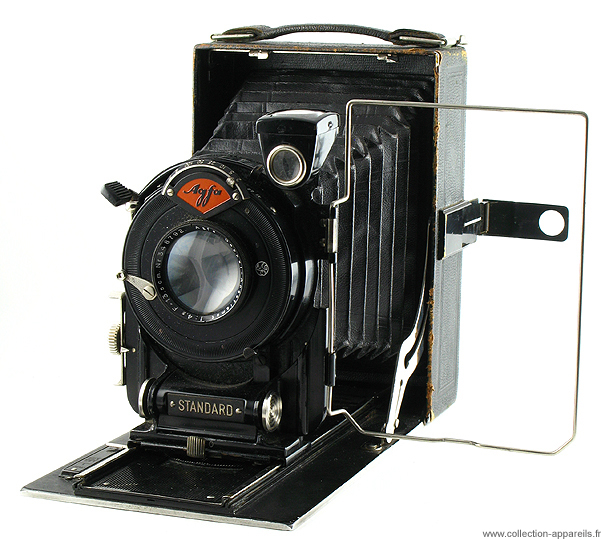 Agfa Standard with plates (and map-Film) exist in two sizes: 204 in 6.5 X 9 and 208 in 9 X 12. It is the second here. Itself exists with two different aperture lens 4.5 or 6.8. The model presented has a 4.5/13.5 lens and one Gauthier shutter allowing speeds 1/2, 1/5, 1/10, 1/25, 1/50, 1/100 and the B and T positions. It is a very beautiful entirely metal folding camera covered with fine leather. It has two viewfinders. Largest is quite manufactured, because it back part folds up itself and slides inside a tiny room which avoids any inopportune roll-out.